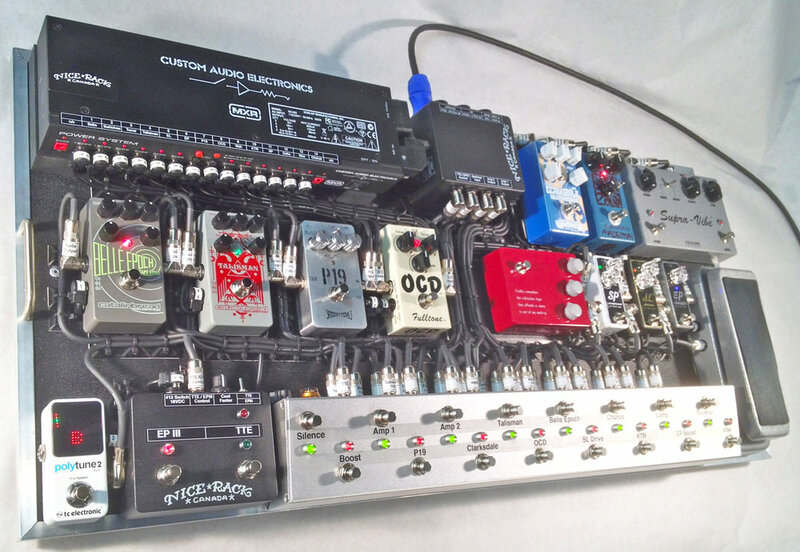 Nice Rack Canad recently built this series wired pedal board system for a local player who really loves a nice overdrive. We built up a custom switcher using a Road Rage Pro Gea enclosure for Effects Loops, Signal Order Reversing, Amp Sends, Master Mute with a couple of buffers at key points in the signal path. We also built in a Nice Rack Canada Clean Boost Circuit with an "11" knob. The client uses either his Fulltone Effect Tube Tape Echo or Maestro Echo Plex III for real tape delays. We built a custom "Cancel" switch that can be used with both of his favourite tape machines. The Signal Path is Guitar >> Signal Order Reversing Switch In >> Send A to Wah >> Vibe, Send B to >> EP Boost >> KTR >> SL Drive >> OCD >> Clarksdale >> P19 >> Reversing Switch Out >> Compressor >> Boost >> Chorus >> Belle Epoch >> Tape Delay >> Talisman >> 3 Way Split to Tuner Constant & 2x Switched Amplifier Outputs.